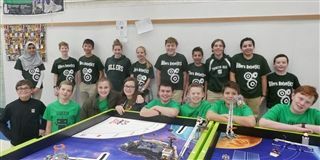 Congratulations to the two Middle School LEGO Robotics teams, “Hillers Robotics” and “Green Machine,” on qualifying for the state competition in the FIRST LEGO League state qualifier on Saturday! Teams were judged on their project presentation, core values presentation, robot design presentation and their scores from the robot game. Green Machine also won the "Gracious Professionalism" award, which recognizes the team whose members show each other and other teams respect at all times. Awesome job!